Canucks defenseman Alex Edler fit the profile of the type of player the Bruins wanted to assume some of Dennis Seidenberg’s responsibilities. Before Thursday’s game against Washington, general manager Peter Chiarelli disclosed on NESN that Philadelphia was assuming half of Andrej Meszaros’s $4 million annual cap hit. That’s because the Bruins, prior to Wednesday’s 3 p.m. trade deadline, believed they needed the space for another acquisition. President Cam Neely told 98.5 The Sports Hub the Bruins had a deal in principle for a player with term remaining on his contract. That trade was shelved, Neely said, because another deal did not happen. According to a team source, the Bruins’ trade fizzled because an expected transaction between Vancouver and Pittsburgh failed to take place. The Penguins had been pursuing Ryan Kesler. According to the Pittsburgh Tribune-Review, the Penguins were offering Brandon Sutter, first- and third-round picks, and a defensive prospect. Once the Canucks moved Kesler to Pittsburgh, they would have proceeded with their trade with the Bruins. The Bruins’ target could not be confirmed. But it’s likely they were targeting smooth-moving left-shot defenseman Alex Edler. 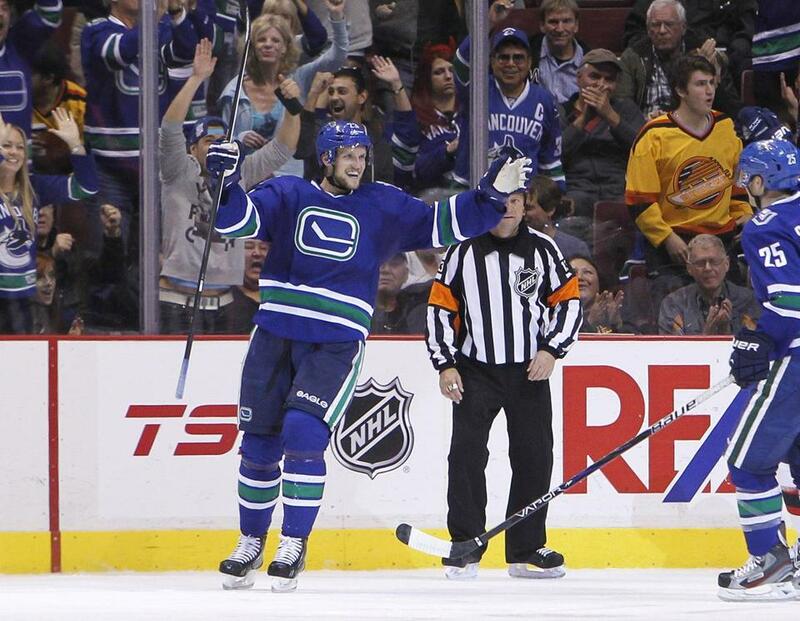 In 45 games, Edler has five goals and 10 assists while averaging 23:20 of ice time. The 27-year-old Edler fits the profile of the type of player the Bruins wanted to assume some of Dennis Seidenberg’s responsibilities: a left-shot defenseman who can play big minutes and move the puck. Edler could have been the left-side man on the No. 2 pairing. Edler would have had to waive his no-trade clause. Vancouver acknowledged the start of its rebuild on Tuesday by trading Roberto Luongo to Florida. Edler carries a $5 million annual cap hit through 2018-19, according to www.capgeek.com. The Bruins would have used the savings on Meszaros’s salary assumed by Philadelphia and applied it toward accommodating Edler. They would have also used the long-term injury exception on Dennis Seidenberg, which would have allowed them to exceed the cap by the injured defenseman’s $3.25 million annual hit. If necessary, the Bruins could have also used the long-term injury exception on Adam McQuaid ($1,566,667 average annual value). During the offseason, they would have had to address Edler’s addition by shedding salary. The Canucks would have received an NHL center in Sutter in return for Kesler. But Sutter is best suited for a third-line role. It’s likely Vancouver would have asked the Bruins for either AHLers Ryan Spooner or Alexander Khokhlachev, both more offensive-minded than Sutter. Spooner (5-23—28 in 32 games for Providence) is quick and clever while boasting high-end speed. Spooner scored zero goals and 11 assists in 22 games for the Bruins while Chris Kelly was out with a broken fibula. Khokhlachev (15-22—37 in 48 AHL games) is not as fast as Spooner but creative offensively. Neither projects to displace David Krejci, Patrice Bergeron, or Carl Soderberg, the Bruins’ top three centers. Vancouver would have also needed a defensive replacement for Edler. The top candidate would have been Matt Bartkowski. Both sides could revisit a trade around the draft. Edler would give the Bruins more mobility on the back end. Had the Penguins acquired Kesler, they would have had a powerful attack. Coach Dan Bylsma could have deployed Kesler as his No. 3 center behind Sidney Crosby and Evgeni Malkin. Part of the reason the Penguins couldn’t generate offense in last year’s Eastern Conference Final was because of the Bruins’ matchup advantage. The Bruins rolled out Chara and Seidenberg, along with the first line of Milan Lucic, David Krejci, and Nathan Horton, against Malkin’s line. Boychuk and Andrew Ference, aided by Brad Marchand, Patrice Bergeron, and Tyler Seguin, played against Crosby’s unit. Kesler could also have been Crosby’s right wing in place of Pascal Dupuis. Either way, the Bruins would have to counter by upgrading their defense. But Pittsburgh didn’t get Kesler. In turn, the Bruins didn’t land Edler. Neither team improved as much as they believed they would. The Penguins landed Lee Stempniak and Marcel Goc to fill out their bottom six. The Bruins brought in Meszaros and Corey Potter as depth reinforcements. Both Meszaros and Potter were healthy scratches for Thursday’s 3-0 win over Washington. Meszaros is ahead of Potter on the depth chart. The left-shot Meszaros could be Chara’s right-hand man. Or Meszaros could displace Bartkowski as the left-side man on the No.2 pairing. For that to happen, Meszaros must gain some traction. Meszaros is coming from a man-to-man defense in Philadelphia. The Bruins play a collapsing zone defense. The Bruins would also prefer Meszaros to improve his conditioning. Partly because of injuries, Meszaros didn’t start 2013-14 in peak shape. It was one reason the Flyers made Meszaros a healthy scratch. It may be, however, that Meszaros could take his time to acclimate. His new team played perfect Bruins-style hockey against the Capitals. They dominated the puck. They took 67 shots (43 were on goal) while limiting the Capitals to 32 attempts. Bergeron led the attack with eight shots on goal. On defense, the Bruins kept the dangerous Capitals from applying any sustained pressure. The top line of Marcus Johansson, Nicklas Backstrom, and Alex Ovechkin, marked by Chara and Dougie Hamilton, landed only two pucks on net. Chara played only 20:38, his fourth-lowest workload of the season. Bartkowski (21:30) and Boychuk (21:52) played more than Chara. Bartkowski, the most vulnerable target for ice time, assisted on the winning goal. Bartkowski put the puck on Bergeron’s tape. Gregory Campbell tipped Bergeron’s one-timer past Braden Holtby. The trade the Bruins wanted to make didn’t happen. So far, it isn’t hurting. Fluto Shinzawa can be reached at fluto.shinzawa@globe.com. Follow him on Twitter @GlobeFluto.